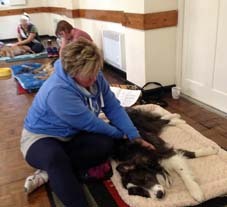 This follow on workshop to A Beginners Guide To Canine Massage and Canine Massage For Agility & Sport is the ideal way to develop the skills you have already learned and add a some exciting new techniques to your Massage-At-Home-ToolBox. We only run this once a year due to teaching and time constraints to BOOK NOW to avoid disappointment! Please note this workshop is for home use only with your own dog, it is not a course which qualifies you to practice with other peoples dogs. If you are interested in this then please see our Clinical Canine Massage Practitioner Programme. NB: There must be a minimum of 6 people in order for this workshop to run. You must provide your own canine companion when attending any workshop!